FAMILY RETREAT WEEKEND. JOIN OUR TS COMMUNITY! The next Family Retreat Weekend will take place June 7 – 9, 2019. 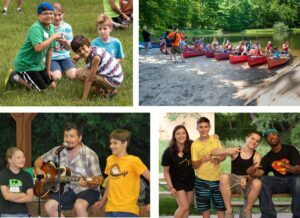 Since 2004, NJCTS has welcomed families to enjoy some time away from it all at the NJCTS Family Retreat Weekend at YMCA Camp Bernie in beautiful Hunterdon County. The weekend allows children and their families to meet others with Tourette Syndrome (TS), learn more about their diagnosis, and engage with peer mentors in a fun, safe environment. Kids enjoy canoeing, swimming, wall climbing, arts & crafts, participating in a talent show, rekindling old friendships, and cultivating new ones. Parents join in many activities with their children but also connect with other parents and share their stories. Powerful workshops provide a safe place for both youth and parents to ask questions about TS and learn from peer mentors. The NJCTS Family Retreat Weekend is popularly known as “the best weekend of the year” to the many families who attend looking for camaraderie, a relaxing getaway from the stress of everyday life, and a chance to learn more about TS and self-advocacy. Tourette Syndrome Clinic: Representatives from the NJCTS Tourette Syndrome Clinic at Rutgers University Graduate School of Applied and Professional Psychology discuss the clinic’s many services. WATCH THIS VIDEO TO LEARN WHAT OTHERS THINK ABOUT THE WEEKEND!